Earlier this week, I met up with the amazing Cheryl from 5 Second Rule. Cheryl is one of the nicest people I've spoken with, she is humble and kind even though she is an award winning blogger and has several cookbooks. We talked for quite a while about blogging, food and life in general. Cheryl also has a new book on one of my favorite ingredients, yogurt. 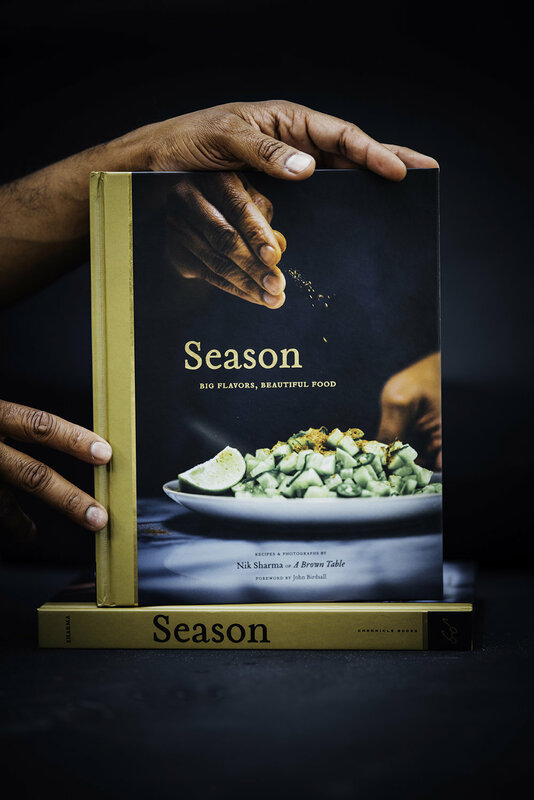 Yogurt culture comes out this April and I can't wait to check it out and see all the fun ways I can eat my favorite dairy. I have a few small pots on our balcony and got all sorts of dwarf trees when we moved in. You can imagine my excitement when I found blooms in my blood orange plant, I wasn't expecting any in the first year! The fig tree has awakened but I haven't noticed any future ovules that will become figs yet. Fingers crossed! Over at Instagram, I hinted earlier that I would revisit this cardamom lime spring berry cake I made last year. Berries are probably one type of fruit that I eat all the time so I feel obligated that I owe lots of "dessertly" tributes to them. This version is completely different, the cake is flavored with Indian chai (Chai is the hindi word for tea) and edible rose petals and then sprayed generously with rose water. 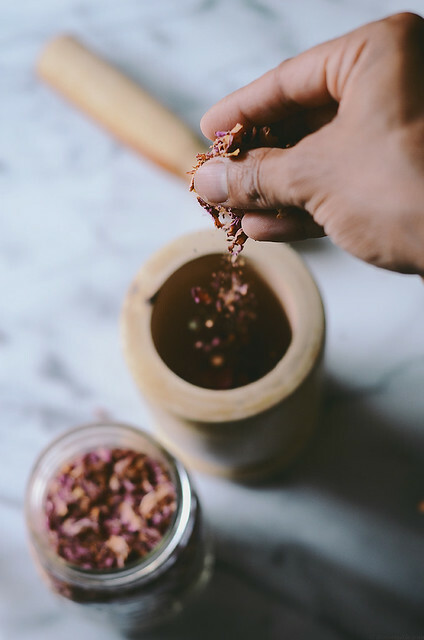 In Indian food you will find rose water and rose petals being used to infuse their delicate sweet flavor in several desserts and drinks, it's one of the culinary traditions that's come via the influence of the Mughal empire in India. This cake takes all of those flavors into account and I tried to bring it all together to make one spring treat. The frosting is made of light whipped cream and cream cheese with a hint of rose water. Then there's a little layer of berry jam and fresh berries in there for that burst of sweetness. Now, my frosting skills are not the best but I have improved significantly since I started working at the bakery. For one, I've learned to hold a piping bag correctly, frost cakes quickly, and decorate them as needed. No more wrist pain with piping bags! Here's the deal with dried edible rose petals, they smell wonderful and will impart their delicate floral flavor to anything they are added. But trying to eat them directly is no fun. I do garnish the top of the cake a little with the dried petals but don't get too carried away. You'll end up chewing way too much for comfort. I use whole wheat white pastry flour as it has less gluten than the regular red grain variety resulting in a tender cake crumb. I can never remember to leave my butter out to warm up when I need to in a recipe. 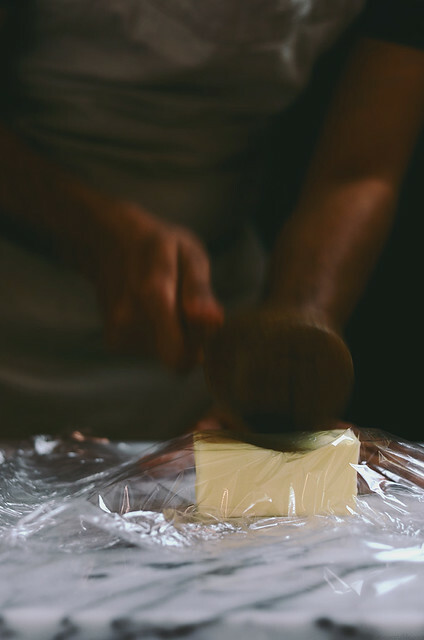 But a little trick I've learned at work, wrap the butter up in cling film and pound it till it is just soft and pliable. Use the softened butter as needed. Coincidentally, this is also something I saw the students do when they were preparing their laminated doughs in the pastry class I audited a few days ago. To slice the cake, I pass 4 bamboo skewers through the center of the cake at mid height. I then slice the cake in half using the skewers as a guide. After the cake is halved, I remove the skewers out. 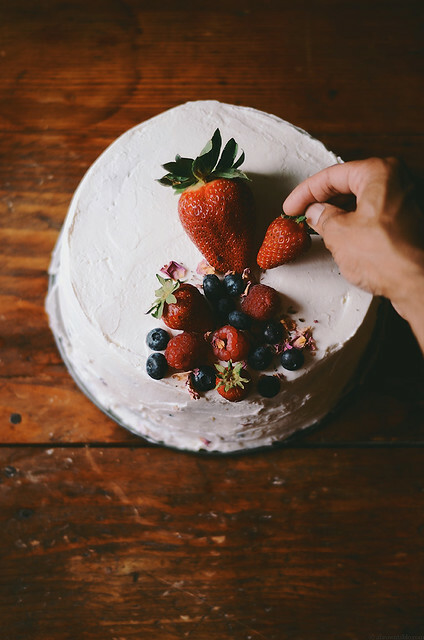 You could certainly, cut the cake in half using any method that works best for you. You can use any type of jam in the cake. I recommend trying jams that are a little more tart such as raspberry or black currant, I personally find strawberry jams to be a bit too sweet and overpowering at times. You can use a springform or regular circular 9 inch pan that is around 3 inches in height. The strawberries help to hold the cake layers together and prevent the frosting from squirting out. But I still recommend keeping it chilled even when you cut through the cake. Use a clean and warm serrated knife when you slice it to get clean and even slices. 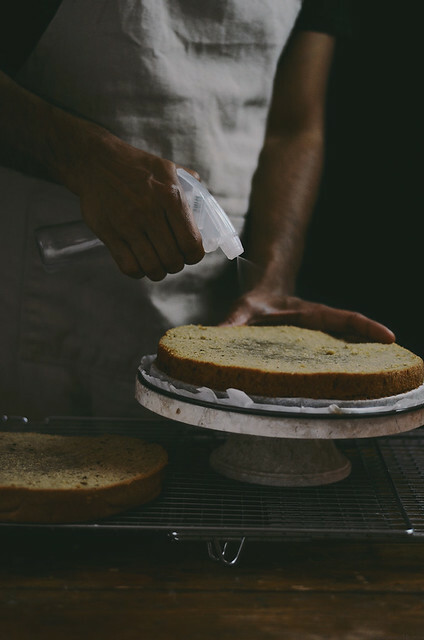 I use a spray bottle to evenly infuse the cake with rose water. Get a cheap one from the dollar store. Alternatively, use a brush to flavor the cake. I didn't add any sugar to the rose water because there really is no need with the jam, the frosting and the cake's sweet profile. I cut back on the amount of cream cheese that would be used in this frosting. Ideally you would use 8 ounces cream cheese to 2 cups heavy whipping cream but I find that to be very salty in taste. If that doesn't bother you adjust the frosting accordingly. 1. Sprinkle the tea leaves over the boiling hot water and leave aside to sit for 5 minutes. Strain and discard the leaves, you should have between 75-50mL of tea infused water left behind. Cool to room temperature completely before use. 2. Sift the flour, baking powder, baking soda, salt and rose petal powder four times and keep aside. Place a wire rack in the middle of the oven and preheat the oven to 325F. 3. Line the base of a circular 9 inch baking pan with parchment paper and grease lightly with a little butter. Place the sugar and butter in the bowl of a stand mixer. Attach the paddle blade to the mixer and cream the sugar and butter on medium-low speed for about 5 minutes. Then add the eggs one at a time and whisk until combined. 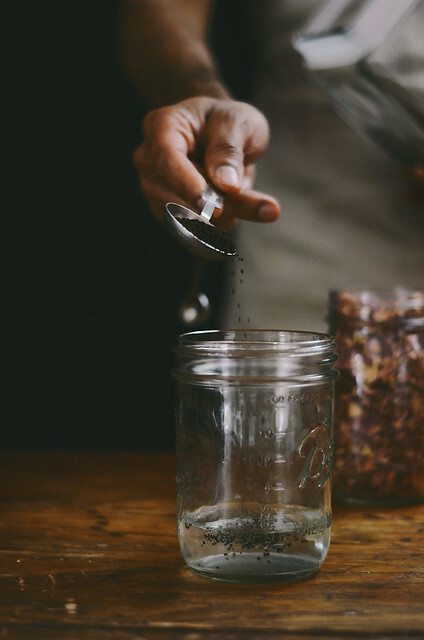 Add half of the sifted dry ingredients to the creamed mixture and mix on low speed for about 1 minute until just combined, then add the tea prepared in step 1 along with the rest of the dry ingredients. Pour the batter into the prepared cake tin and bake for about 35-40 minutes until the center is springy, yet firm to touch or a skewer comes out clean when passed through the center of the cake. 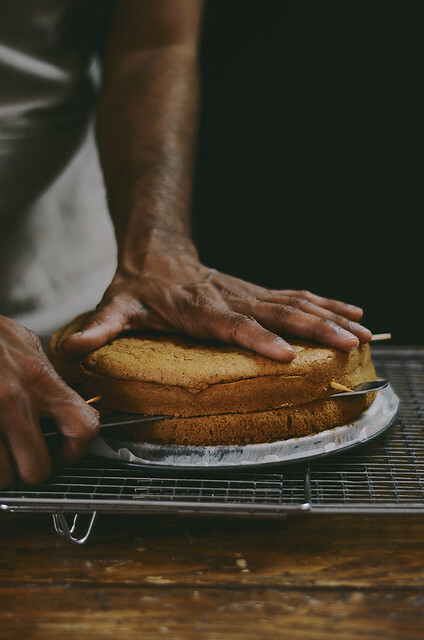 Allow the cake to cool for 5 minutes in the pan, then release from the sides using a sharp knife and cool on a wire rack. Once the cake is cooled, wrap it in cling film and freeze it for at least 2 hours before frosting. 3. 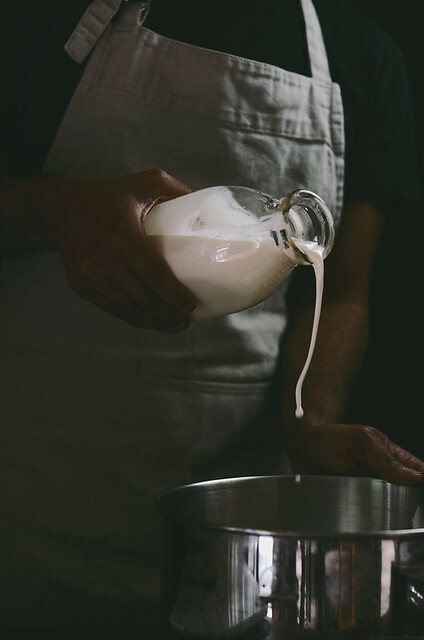 Place the heavy whipping cream, cream cheese, sugar and 3 tablespoons of rose water in the bowl of a stand mixer and using the whisk attachment beat on medium-high speed until stiff peaks form. Keep refrigerated and chilled until ready to use. 4. 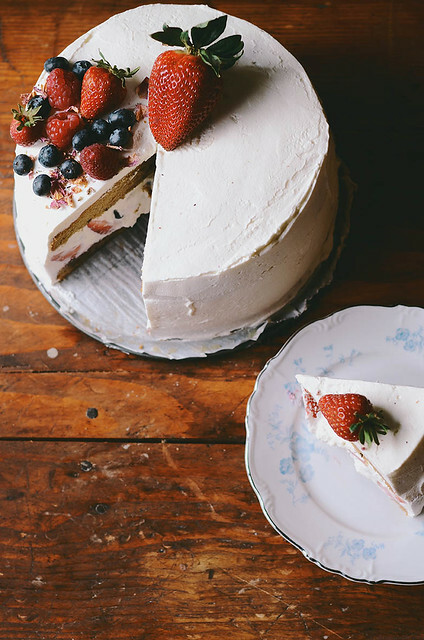 Place the cake on a cake stand/turntable and slice it in half (see kitchen tips above). Spray the inner sides of both cakes with the remaining 50mL rose water using a spray bottle. Layer the bottom half of the cake with the jam using a large offset spatula. Then take 1 cup of the whipped cream frosting and layer it over the jam. Then layer the cake with place the strawberries top side facing upwards in three concentric circles. Fill the gaps between the circles with the raspberries and blueberries. 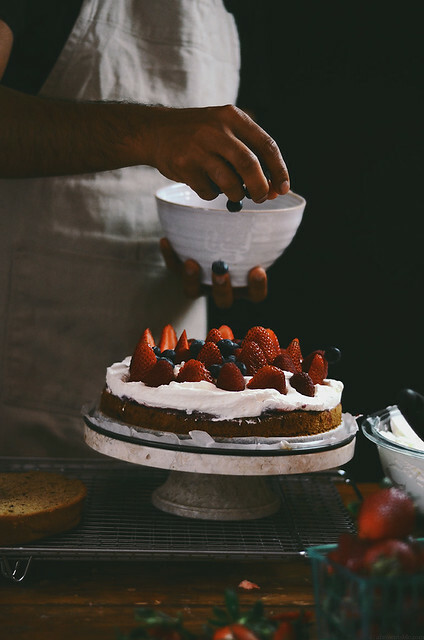 Top the berries off with about 1/2 cup of whipped cream and then place the top layer of the cake over it. Frost the outside of the cake using the spatula to get a smooth and even finish. Decorate with extra berries and a few rose petals. Refrigerate the cake for an hour or two before cutting to serve. This cake will be good for up to 2-3 days.